Greg: Hello, friends, and welcome to Episode 13 of The Greg Amundson Show. My friends, today, I have a special treat in store for you because we are going to leave the comfort of your car, of your home, of your business, of your gym, wherever you are right now. We are shortly on our way to Brighton, Michigan. Brighton is a small city on the outskirts of Detroit, Michigan. And we are headed to a renowned ice skating program called Competitive Edge Skating. This program was founded by a dear friend of mine named Jennifer Matras whom I met in 2014 at the Unbeatable Mind Retreat in Carlsbad, California. The moment that I met Jennifer, I knew this is someone who has the spirit of the Lord profoundly upon them. Jennifer really understands the significance, the importance, she understands the necessity of completely integrating the mind, the body, and the spirit. Jennifer runs a program that is designed for kids to help educate and inspire them through the perspective and through the lens of ice skating to ultimately accomplish all of their dreams and goals both on and off the ice. And when Jennifer asked me last year to come speak at her program, my answer was a resounding yes. And when she asked me to come back this year, of course, my answer, again, was yes. And so, my friends, without further ado, let’s drop in on the lecture that I gave to the athletes. And what’s really special is the parents of the athletes who were in attendance on this very, very special day in Brighton, Michigan. In the words of my dear friend and mentor, Coach Glassman, three, two, one, let’s go. [Brighton, MA] Thank you. It is so good to be back speaking with all of you today. I was here last year. How many of you were in the lecture that I gave last year? Outstanding. So my goal today is to review some of that material because repetition is one of the first laws of learning. So everything that we want to learn and master and be good at we simply have to repeat over and over and over. So today, we’ll repeat some of those very important exercises. Many, many years ago, one of my mentors, a very good friend of mine who remains a very dear friend to this day, he said these words to me, he said, “Greg, if you tell me the truth, I will believe you. If you tell me a fact, I will listen. However, if you share with me a story, then I will remember.” And my goal today is that you would remember the stories that I share with you because wrapped inside every single story is a very important lesson. And if you abide by and practice the lessons that you will learn today, you can achieve anything that you want, any goal, any dream, any aspiration that you have now when you put these lessons into practice you can achieve. We begin by asking ourselves one of the most important questions that we can ask, and that is what is the purpose of my life, why was I born, what am I here to do, what is my unique mission that I have to fulfill, why I am alive. How many of you have contemplated or thought about the answer to that question? Every hand should go up. That question should be burning in our heart, burning in our mind every single day. And the reason for that is that each one of you has a unique gift, unique talents, unique skills, and very special ways of expressing these talents and these skills and these abilities that only you can do. You can do one thing better than anybody else in the entire world. Did you know that? God gave each of you a special gift and a unique way of expressing that gift, and that gift and its expression is why you’re here. Isn’t that exciting? There’s one thing that you can do that no one else can do. And the good news, my friends, is that everybody else wants you to do the one thing that only you can do. Isn’t that great? It’s a win-win. You get to do what you were born to do and everybody else benefits from that. There are some people here right now who know with conviction, with certainty, “This is the purpose of my life. This is my dream. This is what I want to do when I grow up.” Then there are some people that aren’t quite sure. They know they were born for some special reason, they’re not quite sure what it is yet, but they’re going to keep searching for it. And the young man says, “Well, which person am I?” The old man says, “It’s up to you. You get to decide which of those characters you are.” Ultimately, the choice is up to each and every one of you. And an hour later, out of nowhere, rather abruptly the old man raises his hand and signals them to stop. The old man says, “Listen. Can you hear that?” The young boy says, “Hear what?” All the young person could hear is the chatter of their mind, the chatter of their mind. Their own thinking is all that person could hear. The young person says, “Hear what?” The old man says, “Listen, listen very carefully. You’ll hear something.” So they stand very still. The young man listens. How many of you like exercise, like to workout, like to skate, like to run? What are some of your favorite physical activities? How many of you like pull-ups? That makes two of us. How many of you like push-ups? How many of you like to ice skate? I imagine every hand goes up. All right. So there are certain physical skills that you are good at. How did you acquire proficiency in the physical skills that you’re good at? What did you do? Greg: Well, if you were practicing a physical skill, were you being still or were you moving? Greg: You were moving. You have to move to acquire proficiency in the physical skill. As a matter fact, what you likely have to do is practice the specific physical skill that you want to get good at. So imagine if you had a goal to improve on your pull-up, what are you going to have to do with your coach in the gym? Child: Practice. Keep practicing pull-ups. Greg: Exactly. You have to keep practicing your pull-up. And imagine if I came to you and I said, “You know what. I want to learn how to ice skate,” what are you going to tell me that I have to do? Greg: I got to skate. I had to put on skates. And where do I go? Greg: On the ice rink and I practice. And do you think I’ll fall over? Greg: What? Of course I will. I’m going to fall over. Then what do I do when I fall over? Greg: Get back up and I keep practicing. So what we agree on, my friends, is that if we want to be good at a physical skill we have to move our body. Well, one of my friends, a Navy SEAL for 20 years, his name is Mark Divine, he told me something once that I will always remember. He said, “Greg, a warrior has to be skillful both in action and non-action, both in movement and stillness.” Isn’t that an amazing? So very often because of the joy and the excitement and the team atmosphere that we associate with physical activity, that is where we gravitate. All of you are athletes so we gravitate towards doing physical activity, yet that’s only one part of the equation. The other part is equally important, and that is the skill of being still, of stillness. And the reason that stillness is important is in that stillness of our body and of our mind, that is when we can begin to communicate with the very person who assigned each one of you the purpose of your life. God is available to communicate with us when we’re still. Isn’t that amazing? So the skill of stillness is equally important as the skill of physical movement. Why do you think Mark told me a warrior has to be skillful both in action and non-action? Why do you think he used the word warrior? What does a warrior mean in our society today? Do you think warriors are only those people who serve in the military? Greg: No? Do you think a warrior is only that person who lived a long time ago, was a medieval knight or a samurai? Greg: Do you think a warrior is a person who only serves as a law enforcement officer? Greg: Or is there something more? Is a warrior something more that maybe each and every one of us has within us? It’s my contention and sincere belief that every single one of you has within you a quality of a warrior, and that warrior quality, what I refer to as the warrior spirit, is very important to cultivate because only your warrior spirit within you can help you in the achievement of your life purpose. A warrior takes a stand. Do you agree? A warrior’s sticks up and stands for what is right? Do you agree? A warrior has courage. Do you agree? A warrior serves society. Do you agree? A warrior protects and serves other people. Do you agree? Me too. It just so happens that all of those qualities that I described — courage, taking a stand, doing what’s right, protecting and serving — those qualities are necessary when you begin the pursuit of your life purpose. How many of you have played in a competitive hockey tournament or a competition? What happens when you’re on the ice and you’re facing another team or an opponent who is really, really good? What is that other team when they’re really, really good help you do? Greg: Get better. Isn’t that amazing that when a warrior faces challenge, the warrior uses the challenge to improve. That’s a key difference between the warrior spirit and those people that are lacking in that warrior quality, is that a warrior actually looks and goes out and seeks a challenge because they know inherently that when they’re challenged they rise to the occasion. When a warrior faces a challenge they are at their very best. Purpose of life. One of my dear friends shared with me something profound that I want to share with you because this will help you as we pursue that purpose of our life. His name is Kyle Maynard. I met Kyle in 2012 in Austin, Texas. I was there to speak at the Wounded Warrior Summit. I was speaking with Kyle before a group of Marines, soldiers, airmen, corps men who were severely wounded in the war, severely wounded. Some of these brave men and women came back from Iraq and Afghanistan missing arms, missing legs. We were there to give them some encouragement. Kyle was born with no arms and no legs. Wouldn’t you think that someone born with no arms and no legs would have a fair amount of excuses for not being a warrior in life? Well, let me share with you some of the amazing accomplishments of Kyle. Kyle became an NCAA wrestler, college beckoned as an NCAA wrestler. Kyle was a mixed martial artist. Kyle hiked Mount Kilimanjaro. Kyle became a world-class bench presser with no arms and no legs. Kyle was an amazing speaker that day. He was so full of inspiration and education for everyone in the audience because many of these soldiers who came back missing arms and legs had great despair, and they thought to themselves, “My life is over. I’ll never be the same again.” And Kyle was there to share with them your life has just begun. You can do anything you want. You can accomplish your dreams and goals because the greatest muscle that we have — do you know where it is? In our heart and in our mind. With the heart and mind merged, we can do anything that we desire. On the whiteboard that they were three circles. I’ve drawn those three circles here. I’m a very visual learner and so when Kyle explained the significance of these three circles it really stuck with me. What Kyle said was there are three circles that determine the quality of your life. The third circle, the largest circle, Kyle said that is the circle of what, what is happening in your life. Most people live entirely in the circle of what. You even hear this in conversation. People say to each other, “What’s going on?” If we’re talking about what’s going on, it means that we’re reactive, we are reacting to what is happening in our life. And as we’ll learn, warriors are not reactive. The next type of person is living in a more profound, more meaningful way. The next type of person is concerned with that middle circle, the circle of how. So that type of person isn’t as concerned with what is happening. They’re more concerned with how they are going to respond to the conditions of their life. That is much more powerful. For example, let’s take it to the ice. Imagine you’re facing a very, very good team. This team is undefeated. And, of course, your goal is to win this competition, to win this game. Do you think it would benefit you and your coach and your fellow athletes if you thought to yourself, “Oh, what are we going to do? What are we going to do? This team is so good. They’ve got the best players. What are we going to do?” Or do you think it might benefit you and the team if you thought to yourself, “Here is how we’re going to win.” What’s more powerful? “What we going to do?” or “I got. Here’s how we’re going to win”? What’s more powerful? Exactly. Here is how we can do it. Remember this. He said the more powerful the why of your life the more powerful your life will be. Let me say that one more time because, my friends, this is amazing, this is amazing. The more powerful the why of your life the more powerful your life will be. Do you know what Kyle was referring to when he spoke about why? Why is purpose? So essentially what Kyle said is when you really come home to the purpose of your life when you know what the purpose of your life is, when every morning you wake up full of energy, full of enthusiasm, full of excitement, full of love, full of joy because you are certain that you know the purpose of your life, your why, then your life will become extraordinarily powerful. There is a specific skill I want to share with you, a technique, yet before I teach you this technique and explain its significance let’s me ask you a question that one of my coaches asked me years ago. How many of you know how to breathe? I hope every hand goes up. Everyone seems to be breathing okay. So everyone, therefore, knows how to breathe because you’re here right now breathing as you listen to me speak. And Dave Grossman that day taught me and the other agents a very powerful breathing technique. Unfortunately, I did not pay attention. Well, thank goodness, God gave me another opportunity to learn that exact same breathing technique. In law enforcement when you learn the same thing twice from two people that you admire greatly, you know what we call that in law enforcement? A clue. It’s a clue that oh, I better pay attention because someone is trying to teach me something. The second time I learned this breathing technique was from a gentleman named Mark Divine who I already mentioned. Mark Divine, 20-year Navy SEAL, yet not only a Navy SEAL, a commander of Navy SEALs. Navy SEALs are some of the most elite warriors of the United States of America. And Mark Divine led those elite warriors. He taught me the exact same breathing technique that Colonel David Grossman taught me. In 2010, I went through a program called SealFit. It was devised by Mark Divine, a 50-hour course, nonstop crucible evolutions. The whole point of those 50 hours was to weed out people who were weak, who didn’t have what it took to graduate from the program. Brutal conditions, brutal training, brutal evolutions. And before it began, I was standing with the other candidates on the Grinder in San Diego, California. The Grinder was the historic location where this SealFit program took place. I was standing there in formation sweating because I was so nervous and scared and afraid about what was going to take place. Well, here is what I learned from Mark. In the warrior tradition it was believed that each and every one of us has in our soul two dogs. One dog is known as the dog of courage, the other dog is known as the dog of fear. The dog of courage is starving. The dog of fear is starving. Here’s the difference between these two dogs. The dog of courage is starving for one particular type of nutrition: Positivity. The dog of fear is starting for one particular type of nutrition: Negativity. And I remember thinking to myself, “Whoa. Two dogs inside me: Courage, fear. Which dog will win?” Mark explained which ever dog you feed. The question, my friends, is up to you because in this moment and in every moment of your life those two dogs are very hungry, they want your attention, both of their tails are wagging. They’re trying to get you to pet them and play with them and entertain them and feed them. The question is which dog will become stronger, which dog will grow up and be wise, which dog will grow up and be your faithful, loving companion. It’s up to you. Which dog will you feed and how do you feed these dogs? What are they hungry for? Positivity and negativity. What fuels the positive and the negative? Right here. You’re thinking, your own thoughts are the source of nutrition that these dogs want. They want your thinking. What type of thoughts does the dog of courage want? What do those thoughts sound like? They sound like this. I can do it. I believe in myself. I’ve got this. I’m strong. I’m courageous. I’m healthy. I’m faithful. I’m committed. I’m disciplined. I’m skillful. I can do it. What does the dog of fear want from your thinking? I can’t do this. I’ll never learn that. That team is too good. I don’t feel good today. I’m weak. I can’t do it. Do you feel the difference? Energetically, do you feel in your body the difference? What happens when we say to ourselves or when you hear me say, “I can do it, I believe in myself, I got this, I’m strong”? Do you feel the energy? What happens to your breathing, to your posture, to your mind as opposed to, “I can’t do it, I’ll never learn that, I’m not strong enough”? What happens to our breathing, our posture, our energy? Do you see how they shift? That’s why it takes a warrior because only a warrior can discern the difference between the positive and the negative. It takes a warrior to feed the dog of courage. Now, the good news is that after Mark explained the dog of courage and the dog of fear, after he taught me that which ever dog I need will grow stronger in my life, he taught me how to get both dogs to sit down because imagine if you had a dog that you wanted to feed. What does the dog need to do before you can give it a treat? Greg: A trick? Absolutely. Do think that trick could be sitting down? Yes. For example, my dog comes to me I say, “Sit. Good girl,” and I give her a cookie. Why? Because she sat down. And when she sat down she was looking at me, she was still, she was paying attention. It’s the same thing with our mind. We need to get our mind to be still, to pay attention to what we want. Do you want to learn that technique? I want to teach it to you and I really want you to learn it the first time. So really pay attention. It’s a very simple breathing technique. We’re going to breathe in a very specific manner. We’re going to breathe through our nose. The reason for the nostril breath known in yoga as ujjayi breath is the nostril breath is the breath of a warrior. Did you know that when you’re afraid, when you’re feeling stressed, you automatically breathe through your mouth? When you feel confident, when you feel courageous, when you feel close to God, you automatically breathe through your nose. When you breathe through your nose you send a signal to your brain, you send a signal, a message to your brain. You’re telling your brain, “I’ve got this.” Nostril breath. I can do it. So we’re going to utilize that style of breathing with this breathing exercise. We’re also going to do something very important. We’re going to synchronize the body with the breath. And so before we start breathing together let’s take a moment to sit up in our seat. Put your feet on the ground then bring your back against the back rest of your chair. Nice. Roll your shoulders back. Beautiful. Then imagine there’s a string attached to the crown of your head with that string up to lengthen your spine. Nice. Nice and straight. Beautiful. Now direct your attention to this diagram of the box, and I’ll lead you through the breathing exercise. Begin by letting all the air out. Exhale through the nose. Good. Now inhale through the nose. Two, three, four. Hold your breath. Two, three, four. Exhale through the nose. Two, three, four. Hold your breath. Two, three, four. Inhale. Two, three, four. Hold your breath. Two, three, four. Exhale through the nose. Two, three, four. Hold your breath. Two, three, four. Inhale. Hold. Exhale. Hold. One more round. Inhale. Hold. Exhale. Hold. Good. Now, just take a deep breath in and a slow breath out. Just take a few moments to feel the energy that you’ve cultivated in your body and your mind. Notice that quality of stillness. So in this moment the analogy, the example we use is that both of these dogs are still. And now you get to decide which dog gets your attention. Which, of course, is going to be what dog? Greg: The courage dog. Exactly. So what that courage dog is hungry for is your thinking. What type of thinking? Positive thinking. Well, guess what else that courage dog is really, really hungry for. Positive speaking. They want to hear your voice. Because — think about it — if you’re training your dog, can that dog read your mind? Greg: So how do you direct the dog to do what you want? Your voice. You tell your dog sit, lay down, roll over, come. You tell your dog what to do and it listens. So we’re going to use our voice for what’s called a mantra. Mantra is a Sanskrit word. It comes from yoga. Mantra means mind tool. It’s a tool of the mind. It’s a technique. So imagine on the ice, are there specific techniques you learn on the ice? Greg: Well, guess what. There are specific techniques that we can use off the ice that will help us when we get back on the ice, and one of them is mantra. Mantra is mind tool. We’re going to speak a mantra. I’ll teach you a very basic mantra that serves me well. I can do it. Seems simple, right? Greg: It’s supposed to be simple because we’re training a dog, and dogs need to keep it simple. So I can do it will be the mantra that we use. Now, listen to the way I say that mantra. I can do it. Do you believe me? Greg: How about now? I can do it. I don’t believe me either. How about now? I can do it. Some belief there? What did I do before I spoke? Children: You took a breath. Greg: What type of breath? Greg: Nostril breath. What did my body do when I breathed? Greg: Yes, I stood up, I rolled my shoulders back. The breath of life came into my lungs, and I spoke with power and conviction. So now we’re taking what’s called box breathing. Why do you think it’s called a box breath? Yes. Greg: Exactly. Our breath does four of each. Perfectly said. So our breath, therefore, makes a box. Well, when we practice the box breath we do four rounds, yet when we need the box breath in life all we have to do is this’ breathe in and speak. Because as we speak what happens to the breath? Exactly. We are exhaling as we speak. So I inhale the breath of life and I exhale the dog of courage. So we’ll practice this as a group. We’re going to sync together everything that we’ve learned. So sit up nice and straight, roll those shoulders back. We’re going to inhale through the nose and then, out loud as a group, we’re going to say I can do it. And I want to believe you. You ready? Inhale nose, exhale mantra. I can do it. Good. One more round. Inhale nose, exhale. Children: I can do it. Greg: Now stand up. Good. Roll the shoulders back. Okay, ready. Inhale nose, exhale. Greg: Now make me believe you. Inhale nose, exhale mantra. Greg: Now use your hands or hand and pump it up. Let me hear some energy in your body. Ready. Inhale nose. I can do it. Greg: Now I want to hear one more. I want everyone on the ice to hear you. You ready for that? Send this message through the entire arena. Ready, last one. Inhale nose, exhale. I can do it. Greg: Yes, you can. Give yourselves a hand, guys. All right. Have a sit. And thank you so much for your attention and your participation. You did an awesome job. What are your questions? Any questions that maybe you had from last year that you want to ask today or maybe it’s the first time you’ve heard me speak with you and you have a question. Any questions. You guys get it, huh? You get it. It makes sense, doesn’t it? Let me hear from one or two of you what is the purpose of your life. How many of you really know what you want to achieve in life? Not just the gold, not just winning a competition or getting your next pull-up but something bigger than that. Who feels that sense of knowingness? Who’s that character here in the room that put your pan in that water and struck gold right away? I know there’s someone here, there always is. Let’s hear it. Yes. Riley: I want to play college hockey. Greg: Outstanding. College ice hockey? Now, here’s a question for you. What’s your name? Greg: Riley? So Riley, you want to play college ice hockey. If Kyle Maynard were here, do you know the follow up question he would ask you? Greg: Why. So why do you want to play college ice hockey? Riley: Because I love it. Greg: You love it. Why do you love ice hockey? Riley: Because I can escape from all my troubles. Greg: So when you’re escaping from troubles what are you experiencing? Greg: You feel free. Do you feel joy? Greg: Do you feel love? Greg: Do you feel enthusiasm, maybe even close to God? Greg: Yes, exactly. So when we are expressing the unique talents that we have, those are all the qualities that we will feel. So I’ll tell you this, Riley, there is something about the purpose of your life that is really integrated with your expression of those qualities on the ice. So one of the questions we can ask ourselves when we’re pursuing the purpose of my life is what do I do and when I’m doing it feel really good. So maybe when you exercise you feel amazing. Maybe when you’re encouraging your friends you feel great. Maybe when you’re playing hockey you feel incredible. God gave you specific skills and abilities to use just like any gift. Imagine a gift that your parents gave you, and you really wanted that gift. And now you’re playing with the gift that you received. How do you feel? You feel great, you feel happy. Well, it’s the same thing with fatherly gifts, gifts from God. When we use them we feel great. That’s the whole point of the gifts that we have. And here’s the good news. When we use those gifts in the fulfillment of the purpose of our life, that is when we can achieve anything that we desire. Well, my friends, I hope that you enjoyed that lecture and presentation, and in respects, that ministry that I gave to the families and the athletes who were part of that special day in Brighton, Michigan. In the same manner that I prayed that day for those kids and those athletes and those parents, I want to take a moment to pray for you. God, I just pray that in this moment, God, that you would abundantly bless the listener of this show, God, abundantly bless every department of their life. And God, I know from the experiences in my life and the experiences in the lives of my mentors, God, that the real abundance we all seek is abundance in our mind. God, I pray, therefore, that the quality of every thought in the listeners’ mind right now would increase, would expand, would enlarge and would come to life, God. Bless their mind. Put a new and right spirit within them. God, keep them safe and help them to discover the purpose of their life and to fulfill that purpose every day. Well, my friends, take care, and I will speak to you again soon back here on our next episode together of The Greg Amundson Show. Take care. Female: Thank you for listening to the show. Please subscribe, rate, and share this podcast. 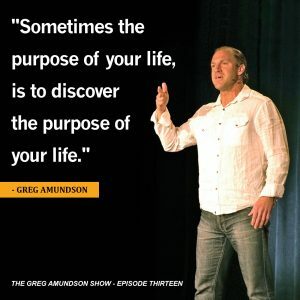 You can find more info at gregoryamundson.com. Take care and God bless.